When I was a teenager, I used to dream to travel and discover ancient rests of cities, all covered by thick tropical forests, that make you access hidden worlds and reveal secrets of legendary people. This dreams made me grow up with the will to follow my imagination and travel to Mexico! At that time, I used to read an old book by Von Hagen, which was called “THE MAYA – Adventurous travels of Stephens and Catherwood.” It was all about two archaeologists who followed their faith and devoted their lives to bring back the culture of the legendary Maya people. MAKE THE MOST OF YOUR LENS KIT TO GET THE DESIRED EFFECT. When you shoot, it’s always good to keep in mind the idea we want to convey through our picture, and starting from this idea you can better understand how to best use your kit to make it come to life. In my case, I was exploring the fantastic Maya buildings, all immersed in the nature which frames them. I was carrying my camera with a 24mm lens attached, which proved to be totally versatile and useful in these diverse situations. The idea I got was to exploit this nature as the frame of this work of art, composed by the Maya houses and buildings. The 24mm allowed me to have a broader view, without losing depth of field, and without distorting the images. It took me a decade for me to get to Mexico for the first time, with two other crazy travel companions. With me, there was an inspired and curious woman, which visited the whole Latin America with me, and who crafted all these images. What happened during the Mexican days, we keep it in our hearts, and live it as a dream that we want to share with you in this travel diary. 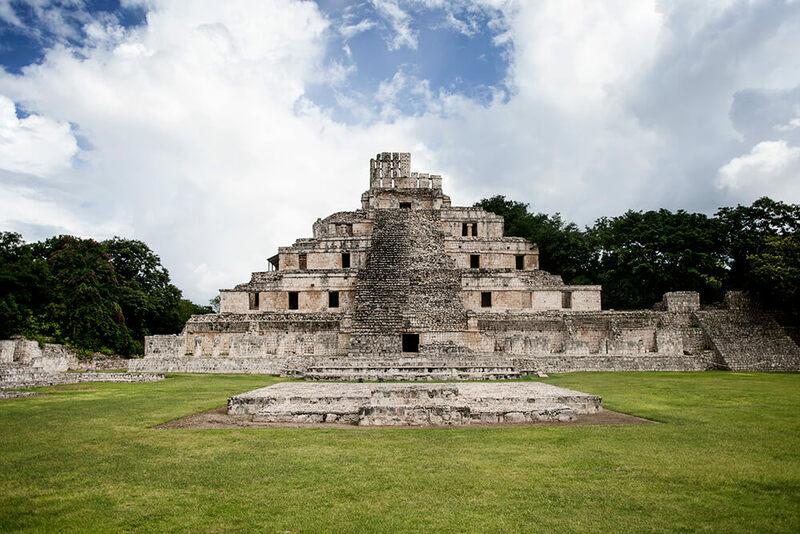 Our travel to Yucatan/Maya starts from the south, from the Pueblo Magico Di Bacalar, where we arrived after two-days exploration of the archaeological site of Palenque, Chiapas. 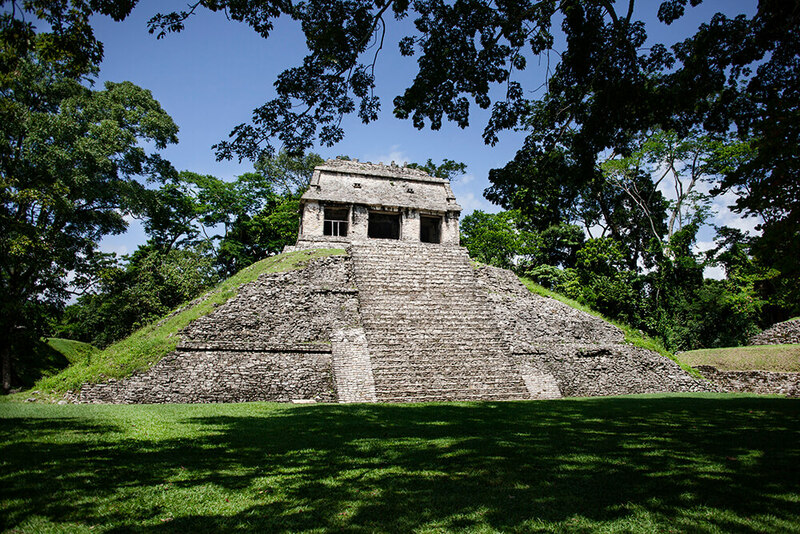 It’s a broad and well preserved site, located on the western side of the Maya territory. Here was the kingdom of the Pacal King, who was buried in the Temple: the great building that you’ll notice as you come into the archaeological site. 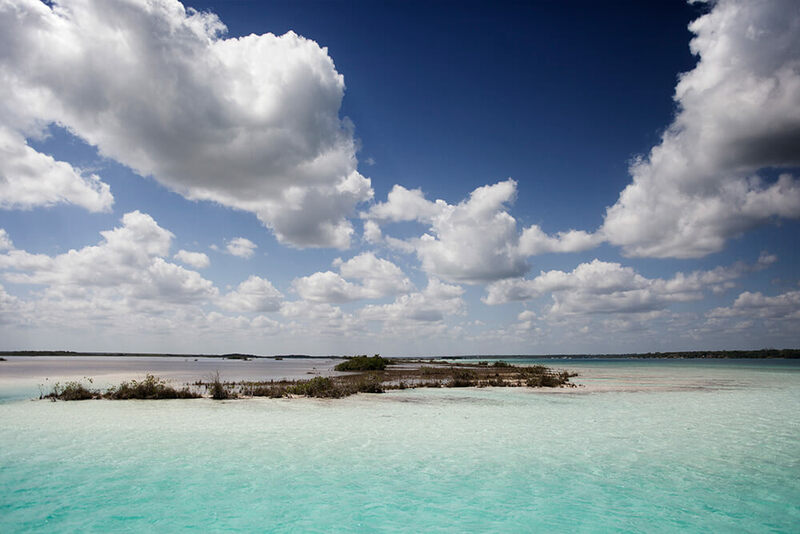 Talking about Bacalar, this was a fabulous worls which looks surreal, and opens un on the shimmering colours of the unforgettable lagoon: la laguna de los siete colores. When talking about the lagoon, most Europeans tend to think of a dark, humid landscape, but this idea gas nothing to di with Balalar! The water is blue, and crystal clear, and it blends with the blue sky. It’s a magical place and it evokes mysteries and legends, which are linked to the Inframundo, the secret world of the Maya. Maya believed that thorough the cenotes (some holes on the ground which are full of water) they could access another world. 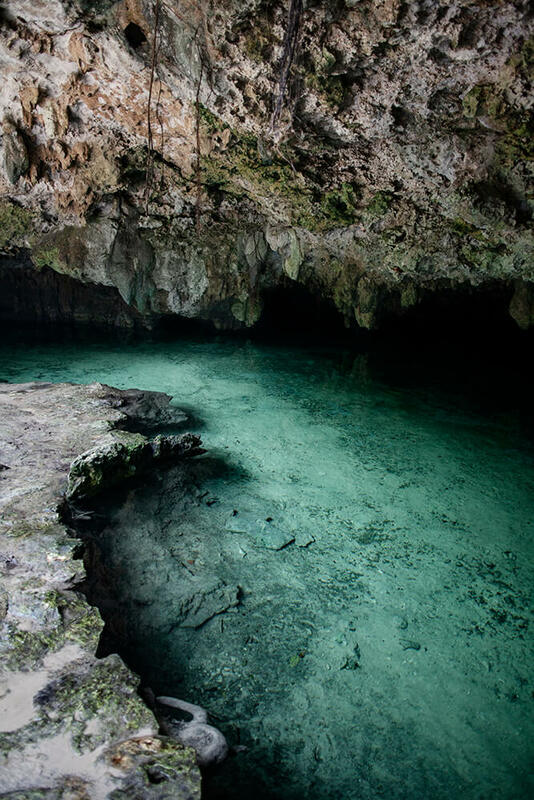 But to better understand the cenotes legend, we need to go to Tulum, which is 200km away from here, heading north, on the Quintana Roo coast. When the Conquistadores reached these seas in search of fortune, they saw a castle on the coasts, but couldn’t reach it because of the coral bay, which prevented all boats from reaching the coast. That was the Castillo, the last construction of the Maya civilization, which was already starting its end. 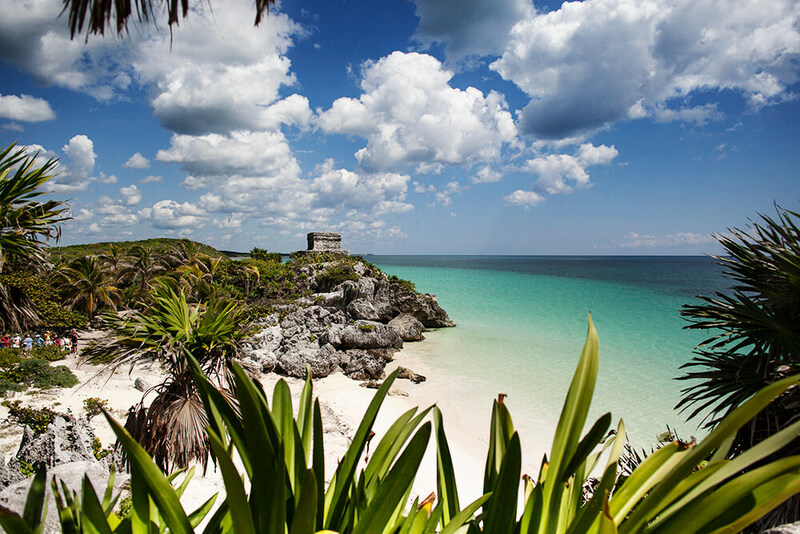 Today the Tulum site is one of the most visited places in the entire Mexico area, thanks to its scenographic position, on the blue Caribbean sea. The whole archaeological site is truly interesting, especially if you look at the Castillo from below, immersed in the ocean. Here we are in one of the many cenotes near Tulum: a true gift by Mother Nature, and it opens the doors to the center of the earth. They are long, deep water corridors and caves which dig the underground. You can reach them through natural holes like the one in the picture. In this picture, I wanted to portray these elements: the depth of field, the darkness of the location, the contrast between light and dark, and respect the natural shapes of the rocks. When I shoot, I always focus on a particular detail inside the image, which will then become the protagonist. In this case, it was the crystal clear water, and the idea of the underground. I’m still using my loyal 24mm, and I can find the compromise between the shutter and the aperture not to miss too much depth of field, and still manage to get enough light, so my camera settings are the following: f: 5,6 with 1/60 and ISO: 640. Once I fixed the technical settings, I look for the right angle. 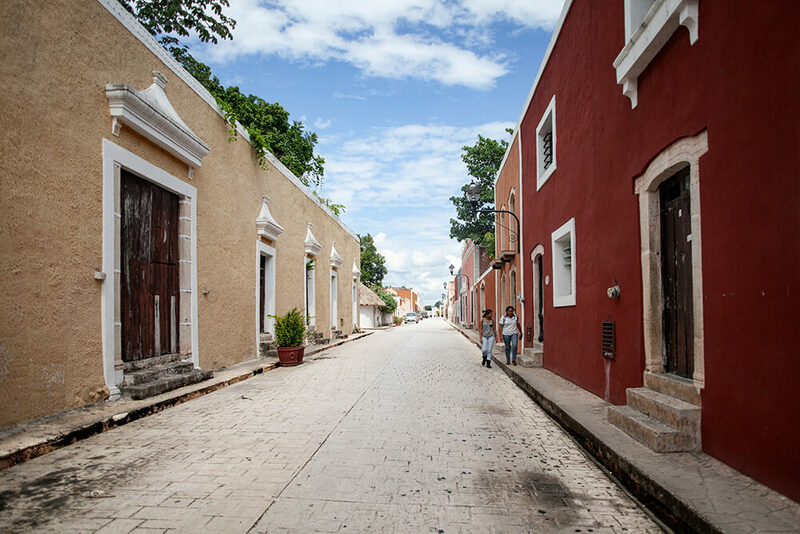 After this, we move towards Valladolid, one of the most beautiful Pueblos in Yucatan. An important hub for the Maya culture and craftsmanship. The coloured houses, the great square of the cathedral, the St. Bernard church, and the numerous boutiques are a touristic attraction. 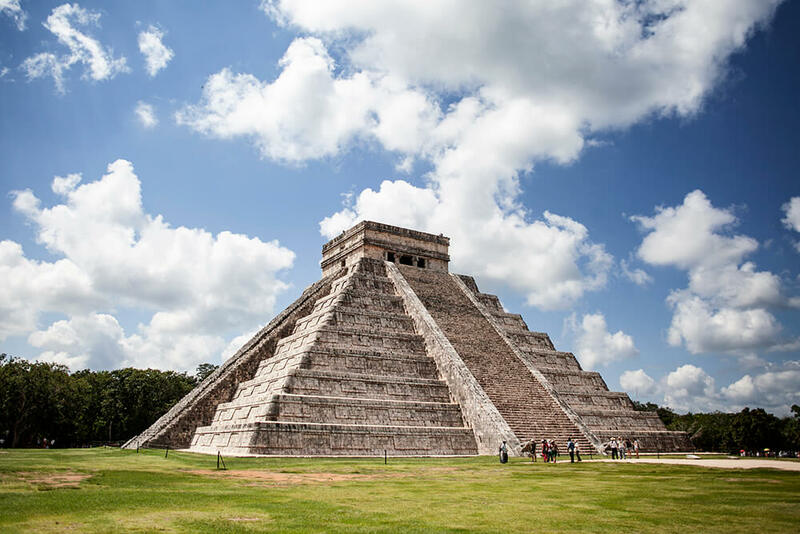 You come here to have lunch after a long trip, and to visit the Chichen Itza, a famous Maya site. When you enter it, you find yourself in front of the pyramid, and you can’t help thinking of the history of this amazing citizenship. When you find yourself next to huge buildings like this one, what one would like to do is to shoot them without people in the frame. I believe this is a wrong idea, because the human presence is fundamental to truly understand the majesty of the pyramid. 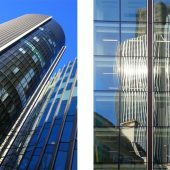 People work as a term of comparison for the height and width of the building, and without them, you wouldn’t be able to understand how big it is!